Carlsberg and Heineken did not invent beer brewing - it's been around for thousands of years. Regular barley belongs to all farmers and cannot be owned for the profit of companies, such as Carlsberg or Heineken. We urge you not to grant patents on regular bred plants and technology which is knowledge that’s been around for thousands of years! 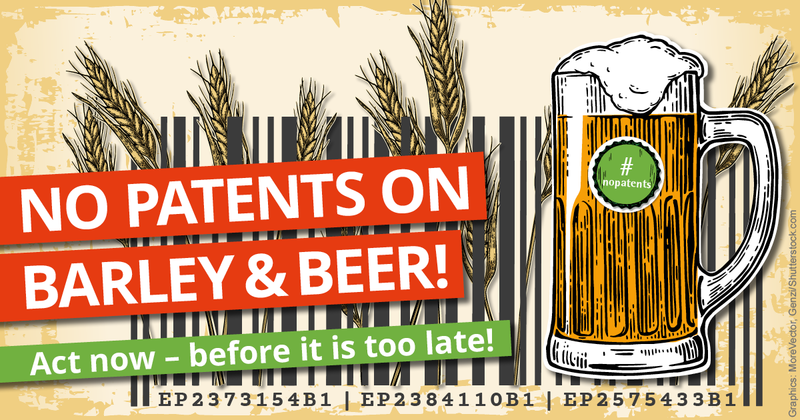 Together with over 30 environmental organisations , we raise our voices in protest and file a legal objection against patents on barley held by Carlsberg and Heineken. We will claim barley back - and take this chance to urge Member States to stop the EPO from breaching EU law. In recent years the European Patent Office has continued to grant patents covering food plants, such as tomatoes, broccoli, melons and, most recently, barley. The scope of such patents is huge: in this case, it covers the barley, the brewing process and the beer itself. In addition, the patent covers all barley plants with the same traits, independently of how they were bred. This means that brewing companies would profit three times over – from selling the barley seeds to farmers, from buying the harvested barley from them, and from selling the beer to consumers. They have the control the entire way -- from the field to the pub. At the same time, the patent gives them the right to prevent other breeders from breeding better barley and allows them to extend their market dominance – to the detriment of farmers, breeders, other breweries and consumers. Our petition will also demand that governments in Europe order the EPO to comply with current regulation. We have filed a formal complaint against the patent. The European Patent Office has responded to inform us that the appeal procedure will commence in the autumn of 2018, which is the end of the prescribed one-year response period for a complaint. Beer must be for all.Not for the few.Keep it small & Keep it Local !!! Beer making should not be under the control of any one company. There is an urgent need to put a stop to the monopolization of plants or their properties and production methods, through patents. Typical greed of big corporations, want to own everything whether they invented it or not to try & squeeze out smaller companies. Brewing beer is an ancient art. There is no inventive step that justifies a patent of this kind. A patent like this will reduce both quality and diversity of our beer. Carlsberg and Heineken are pushing really hard to own and control the entire process of beer making – from the field to the pub. We got a hearing to stop this, but we need to double up the pressure before it happens! To fund our campaigning expenses we need your help. Can you chip in a few euros to fight greedy corporations back?